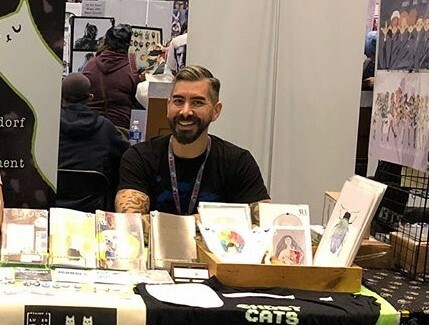 Arinn is the artist behind Ghost Cats. Her work is primarily ink and watercolour. She has been involved in photography and painting for several years. Arinn lives in Vancouver and when she's not drawing & painting, she is probably making preserves, cuddling her cats, or riding her bike. Her work and more information can be found at arinn.com. Brian is the writer and brain-in-the-jar behind Ghost Cats, taking care of stories, storyboarding, layout, and photoshop. He has been writing and directing low-budget films since 2000 and stepped back into his original love, fiction writing, just a few years ago. He is based in Toronto. More information on Brian's writing can be found at brianclement.com.